Internal building surveys - full record scan, can be used to produce standard 2D floor plans, sections, internal elevations or build up full 3D model. Any natural or built environment where comprehensive spatial information is required. UKDS offer a wide variety of river surveys from underwater probing inspections and topographic surveys to underwater 2D and 3D sonar. . 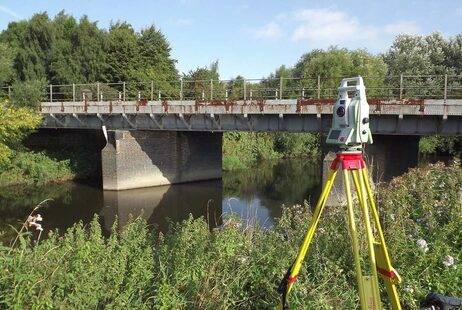 Many of our waterway projects also incorporate work within the rail sector; for example scour prevention and protection surveys of rail bridge structures over rivers and estuaries. Other examples include sonar and topographic surveys for culverts and headwall surveys associated with water catchment areas and flood risk assessments and scour protection surveys. 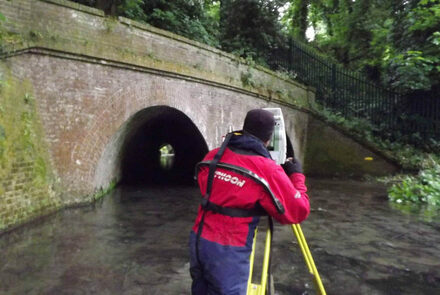 Survey work is also carried out for flood alleviation schemes and flood recovery schemes. Deliverable's are provided in a range of industry standard formats. Our waterway surveys can be used by specialist engineers who use the collective data when designing flood defences etc..
We have carried out many surveys for the Environment Agency with data prepared and provided to their detailed standard specification. If you have a survey requirement which requires access within rivers and watercourses we have suitably trained and experienced staff. You can be assured that UK Diving Services Ltd will work carefully, adhering to the required safety rules and procedures.